Geographical Range: Located on the continent of Asia. 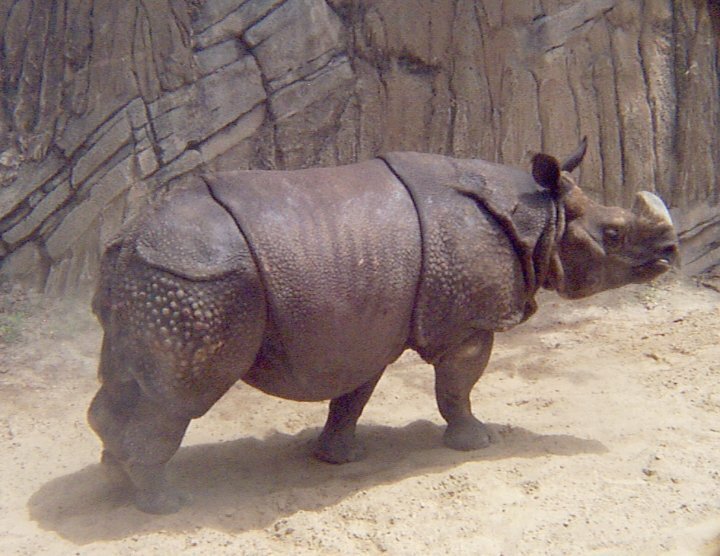 This rhino is limited to locations in India and Nepal. Habitat: Rhinos live in tall elephant grass in swampy places near rivers. They wallow in the shallow water and the mud to cool off frequently during the day. They also go to land that is higher up so they can search for food. Diet in the Wild: Rhinos are grazing animals with a varied diet. They like to eat elephant grass, twigs, bamboo shoots, and water hyacinths. They also like to eat the crops and this makes them a problem for the local farmers. The crops they like to eat are wheat, lentils, and potatoes. Conservation Status: In the Indian rhino's native home they only survive in protected areas. The population is growing steadily and is possibly in danger of extinction. The rhinos have been moved to protected areas in two national parks. Recently rhinos are being hunted down by poachers for their horns. 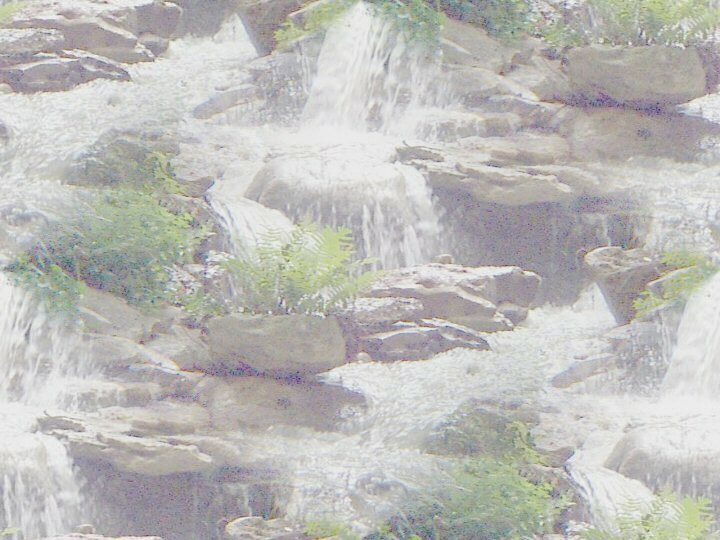 Location in the Zoo: This rhino is located in the "Asian Falls" at the Fort Worth Zoo. They are very territorial and usually live in isolation even from their own kind. The only exception is that they do share bathing pools, wallows, and dug heaps. They make their feeding and sleeping areas their own. If any other animal tries to enter their territory then the Indian rhino will charge after it to make it go away. In the morning the rhinos feed in open areas, they gradually move towards shade as the sun rises. They spend most of the day wallowing together. Towards the evening they move back to feeding areas and graze until it is time for them to rest. Females with rhino calves move to places where tall grass grows to protect young from predators. The bigger rhinos are too large to fear predators so they usually lie where they are feeding. Rhinos have a very keen sense of smell. Rhinos can run speeds up to 28 miles per hour for short distances. 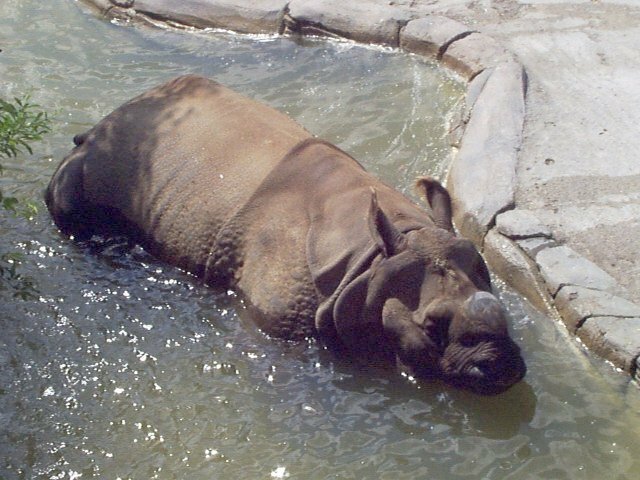 Rhinos wallow in the mud in order to protect themselves from biting insects and sunburn. Rhinos grunt and snort to communicate with each other. Female rhinos whistle to get the male rhino's attention. 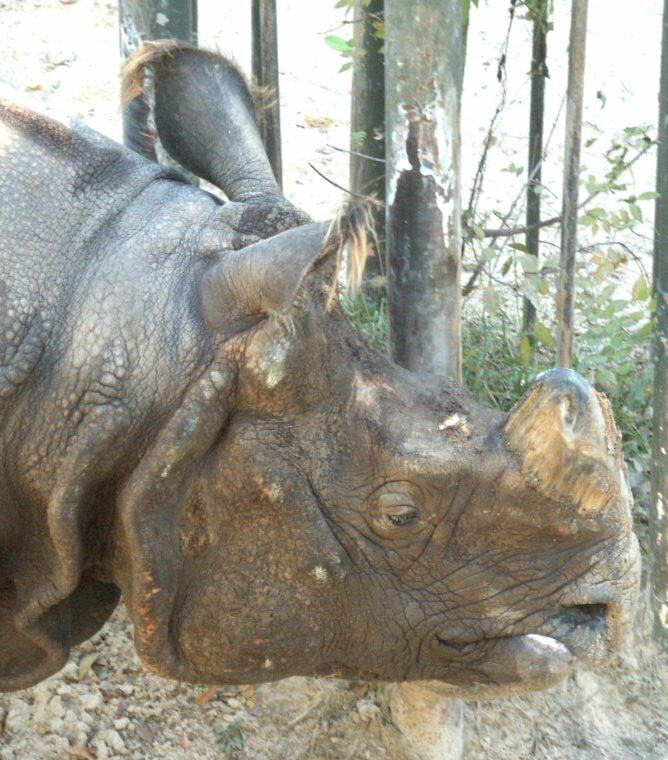 When I visited the zoo, the rhino in the zoo spent most of her time swinging her head from left to right against a metal gate that was her only barrier from the other types of rhinos. She would then back away from the gate and make a loud grunting noise. From this observation I concluded that she was just guarding her territory. She spent the rest of her time wallowing and eating leaves. She also urinated in different spots around her territory, but she only excreted feces in one area of her territory.